The deconsecrated brick Gothic church of Sant’Aponal (Apollinare, the patron saint of Ravenna) has reliefs (1294) in the form of a tabernacle over the portal showing the Crucifixion and Saints; the base of its Romanesque campanile once had the oldest known relief of the Lion of St Mark (the famous 'crab lion', now pensioned off to the Correr Museum). And don’t bother looking in; after serving as a parish church for centuries, it was stripped bare by the French in 1810, and used as a mill and prison. Today the interior is entirely filled with metal shelves, containing all the city’s marriage records. One file a little thicker than the others (if the records go back that far) would be that of Bianca Capello. 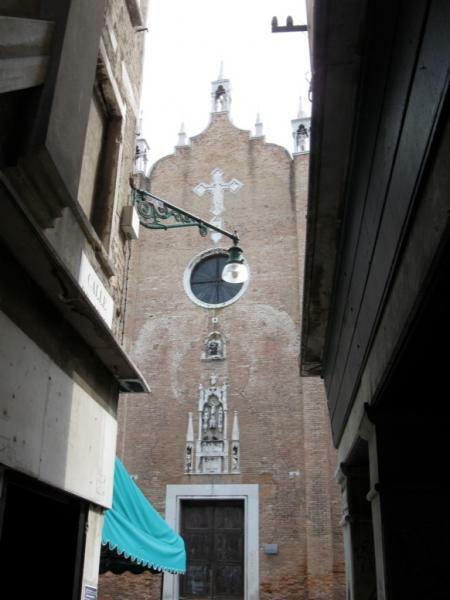 Her house is just around the corner from the church; take Calle del Ponte Storto (left of the church façade) up to the ‘crooked’ bridge, Ponte Storto; hers was the house overlooking it, the one with the neoclassical busts at the head of narrow Rio Sant’Aponal.